I'll be honest, Spelling is something I've never formally covered before. Now that Elliott is reading and writing and wanting to become more independent in these areas, I felt it would be beneficial to start some type of spelling program with him to encourage him along. I was very happy to be given the opportunity to review the brand new spelling program Spelling You See. Yes, this is from the same company as Math-U-See, which we've already reviewed and loved, so I was interested to see how they compared. 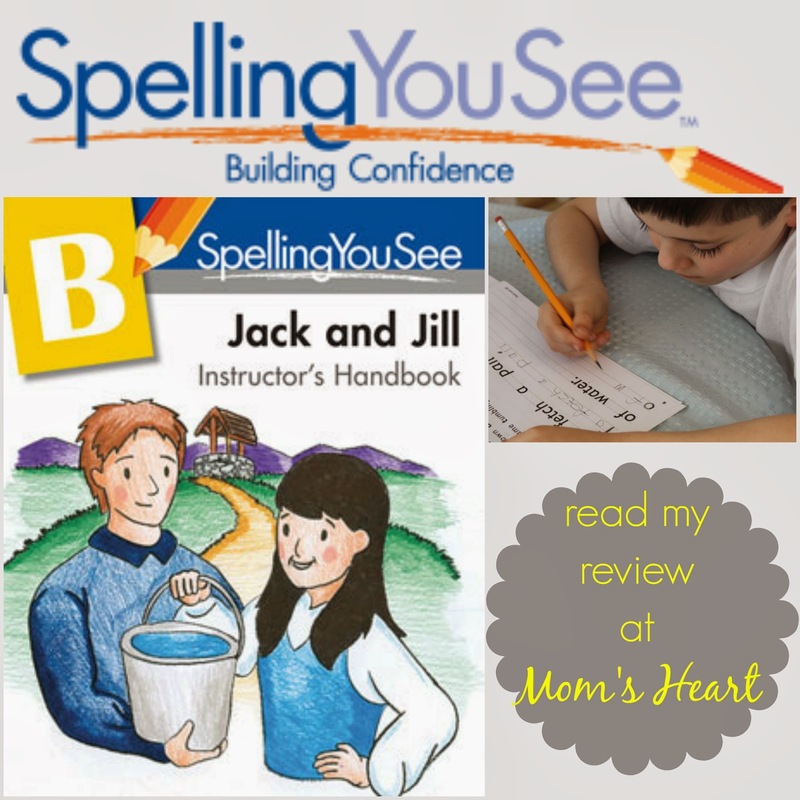 We reviewed Spelling You See: Jack and Jill (Level B), which is the second of the five levels currently available. Jack and Jill, as the name insinuates, uses familiar rhymes to move students from the phonetic stage to the skill development stage. First of all, I am a huge proponent of using nursery rhymes to enhance literacy skills, and I've discussed this before. Secondly, Elliott does fall somewhere between the phonetic stage and skill development stage (read more about the five developmental stages of spelling) so Level B seemed like the right place to start. Since this is not a traditional program, I decided we would just start at the beginning, even though some of it was a review for him. Spelling You See was written by Dr. Karen Holinga. Dr. Holinga is a reading specialist who is also a former elementary school teacher, college professor and homeschooling parent, and has been testing the methods used in Spelling You See since 2000. The program fits with the Demme Learning philosophy because there are no grade levels, children work at their own pace at their level, and the program stresses application, not memorization. Placement is based on the child's current spelling skills; placement does not correlate to their reading level. This program does not offer spelling lists or weekly tests, but instead utilizes copywork and dictation. There are two parts to the full Jack and Jill curriculum. The Instructor's Handbook ($16) covers the program's philosophy, gives an overview of each lesson, contains the dictation lists and the answer key for student lessons. The Student Pack ($30) includes two student workbooks with a total of 36 lessons, a laminated Guide to Handwriting and colored pencils. We started each lesson by reading, clapping the syllables, and pointing to the words. Then the instructions ask the student to underline or circle something specific (punctuation, rhyming words, capitalized names, etc), so there's gentle grammar mixed in as well. Then the student copies a small portion of the rhyme. The second half of the lesson is the dictation. In the early lessons dictation is simple CVC words. While he was beyond this, the dictation really helps train Elliott to actually listen to the sounds. Note: I received an advance PDF copy for the purpose of this review before my books arrived, but the product is only available in physical form. The funny thing is, my son was a little reluctant to use the program initially, but when the actual books came he was more enthusiastic. Each full lesson has five sections (A-E) and each section is two pages, meant to be completed in one day. So if you do the full lesson, you are reading, speaking and writing parts of the same rhyme for five days. Using the words in context repeatedly is an important part of the program, but if you do not complete every section that is fine too, because spelling patterns will appear again. Spelling You See stressed that it is more important that your student is comfortable and making progress rather than just filling the pages. As you progress through Jack and Jill, you cover blends, vowel combinations, 'bossy r' and other rules. The colored pencils are to help you mark things in a color code. The dictation lists are not within the lesson plans in the teacher's manual, but are actually all together in the back of the book. After the specific dictation lists for each lesson, there is a General Dictation List if your child needs more practice. There is also an answer key in the back of the manual, but otherwise, most of the daily instructions for the lessons are in the actual student books. I absolutely love how easy, simple and stress-free this program is. It is open-and-go. There are no flashy components or extra pieces, and there's no scripted passages for me to read or flipping back and forth between the instructor's guide to make sure I'm not missing any points for the day. Easy Peasy. I really like the concept and flow of the program, but it is a little early to tell if it is going to be effective long term. I am still working with an emerging reader/speller, and this is our first foray into formal spelling. That being said, I can see how the program would work well for many people. I never really had issues with spelling, yet I do often find myself writing out a word to physically see it in front of me, because I don't have the visual recall to confidently spell it aloud. I can understand how visually imprinting the correct spelling through meaningful context can be helpful. I've always wanted to try copywork and dictation, but it is something I never knew how to implement. I definitely think this program is compatible with Charlotte Mason, and that's one of the reasons I like it. The lessons are systematic, but they are gentle and short, and a timer is even encourage to keep lessons brief. I love that I don't have to come up with my own copywork passages. Older students who struggle and are placed in Jack and Jill might balk at the nursery rhyme theme, but thankfully Elliott hasn't reached that point yet. Find Spelling You See on Facebook and Twitter, but first, check out the rest of the Crew reviews. We reviewed all five levels! This was a hit with my son, too. We enjoyed using Spelling You See as well when we were reviewing it, but we didn't stay with it. I was going to say I wasn't sure why, but then I remembered we got Logic of English Essentials and ended up preferring that. I'm not saying Spelling You See isn't great. But I sort of had to choose one, and I sort of preferred the traditional approach. Great review though. Thanks for sharing with Throwback Thursday Blog Style. LEGO Love Week 10: More Preschool Fun!